DAYTONA BEACH, Fla.— The Daytona Truck Results are in and by the barest of margins, with a bold move to the outside, Kyle Busch overtook Timothy Peters a few feet short of the finish line Friday night to win the season-opening NextEra Energy Resources 250 NASCAR Camping World Truck Series race at Daytona International Speedway. Busch’s victory was his first at Daytona in the Truck Series and the 36th of his career. The driver of the No. 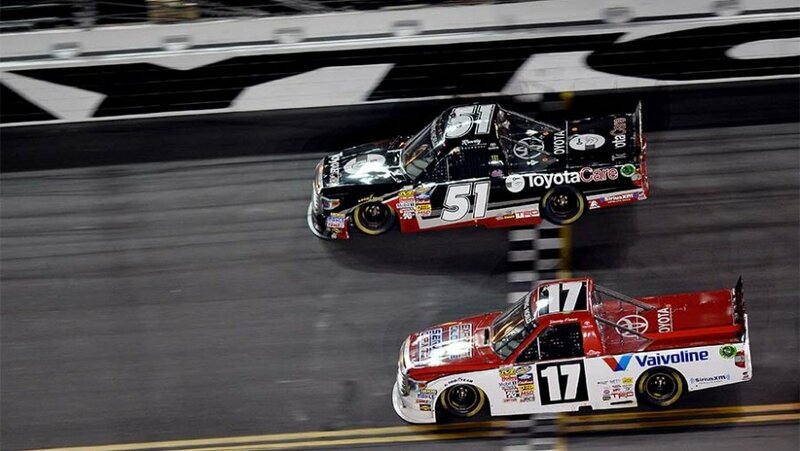 51 Tundra gave Toyota its eighth straight Daytona win by .016 seconds. In part, though, Busch was already looking ahead toward Saturday and Sunday and the possibility of a weekend sweep that includes Saturday’s Nationwide Series race and Sunday’s Daytona 500. Johnny Sauter ran third, followed by Ryan Truex and Ron Hornaday Jr. Ryan Blaney, Jeb Burton, Joe Nemechek, Jimmy Weller III and German Quiroga completed the top 10. Busch was first off pit road after a fuel-only pit stop on Lap 77, under caution for a 16-truck pileup in Turn 2 that started with contact between the trucks of Parker Kligerman and Ross Chastain on Lap 74. After a subsequent caution and restart on Lap 90, Busch grabbed the lead before Peters took in back on Lap 96 and held it until Busch made the winning pass. “He had a good run on me coming off Turn 4, and you know—he’s Kyle Busch,” said Peters, who leads the series driver standings, with Busch not competing for a championship in the trucks. Peters had the only car that could pull the outside line in a side-by-side draft. Ben Kennedy started on the pole, with the field ordered by practice speeds because of a qualifying rainout earlier in the day. The No. 31 held the top spot until Jennifer Jo Cobb’s No. 10 Chevrolet stalled on the backstretch to bring out the second caution of the race on Lap 51. During the ensuing pit stops under yellow, Kennedy stalled leaving his pit box. Though he was first across the timing line at the end of pit road, Kennedy did not maintain cautious pace as he re-fired his engine and restarted sixth on Lap 56, with Busch in the lead. Kennedy’s wasn’t the only snafu on pit road. Ryan Ellis was entering his stall as Blaney was exiting his, and contact between the trucks sent Ellis spinning. Tyler Reddick stalled leaving his pit stall. Defending series champion Matt Crafton overshot his pit box and fell to 28th for the Lap 56 restart. Busch and Peters swapped the lead as the outside line began to move for the first time in the race, and those two drivers ran side by side until Lap 64, when Peters cleared Busch and moved down in front of the No. 51. That’s the way they ran until the massive wreck on Lap 74 knocked half the field out of contention. Note: Kyle Busch is the first driver to win at Daytona in the NASCAR Sprint Cup, Nationwide and Truck Series, as well as the ARCA Series… Busch’s crew chief, Eric Phillips, tied Rick Ren for most wins by a crew chief in the Truck Series with 28.